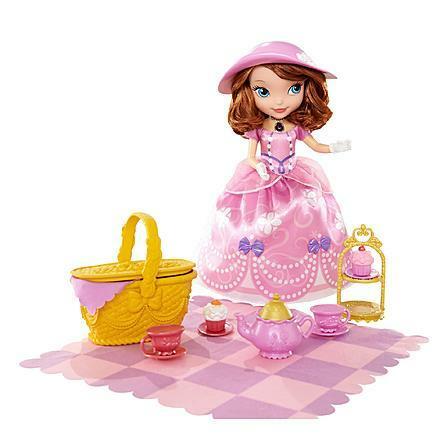 Disney Sofia the First 10" Tea Party Doll Just $18.99! Down From $49.99! You are here: Home / Great Deals / Disney Sofia the First 10″ Tea Party Doll Just $18.99! Down From $49.99! Disney Sofia the First 10″ Tea Party Doll Just $18.99! Down From $49.99! Sears has this Disney Sofia the First 10″ Tea Party Doll on sale for $18.99 (Reg. $49.99)! Plus you can get FREE shipping on orders over $35! The lovable princess-in-training wears a precious pink party dress with a matching teatime hat. Adorable Clover has a bobbling head, long furry ears and wears a delightful blue bowtie. Bring Clover and four interactive tea party accessories close to Sofia to hear more than 40 fun phrases that will make girls feel like they are truly part of this very special tea party picnic. Also included is a picnic basket, which opens to store the teapot, two tea cups, two cupcakes and a pink-and-white picnic blanket. Also included is a golden, tiered dessert tray.